The Mercedes-Benz Stadium Tour will induce a sense of awe and wonder that you never thought possible. Whether it's your first time walking into this majestic icon or if you've been to every game and concert since its first major event—a Garth Brooks and Trisha Yearwood concert on October 12, 2017—this behind-the-scenes tour will enhance every subsequent visit to this magnificent architectural marvel! It was perhaps the coldest day of this winter, the wind unrelentingly biting our faces like starved piranha, but we were so excited about touring Mercedes-Benz Stadium that even a roweled up Mother Nature wasn't going to keep us away. My friend Lauralyn and I had been talking about going on the tour for weeks, so when our calendars presented a serendipitous opening, online we went and booked our tour! Lauralyn's husband, Leo, whom I'd not yet met and turns out to be great fun and an awesome storyteller, joined us. The three of us had a grand time! This is an extremely brief recap of our tour. Even the distilled information on this tour floods your mind with the excitement of game days and concert nights, the marvel of building such a monumental structure, images of the lifestyles of the rich and famous, as well as the vast opportunities for everyone to enjoy a fascinating fan-based experience on every visit to the stadium! I already want to go on this tour again! Our visit was a mere few days following the Georgia-Alabama College Football Playoff National Championship game. Remnants of that day's excitement were everywhere...streamers floating over the field, confetti all over the artificial turf, and the teams' names in the process of being washed away in preparation for the next fan-loving event to take place. I've been on stadium tours before, but we were only ever allowed to stand on a corner of the field to make our photos, and I did so with gratitude. But, on this tour of Mercedes-Benz Stadium, we had FULL ACCESS to the ENTIRE FIELD! We covered it corner to corner, and one father had brought a football that he passed with his son...on the Atlanta Falcons field! How cool is that! Even in an empty stadium, you can feel the excitement of game days and concert nights. When we arrived at the check-in point, having entered throught Gate 2, and had secured our color-coded wristbands, we were permitted to meander in the immediate vicinity, near Molly B's, checking out views of downtown Atlanta and looking over the game field. I was struck by how small it seemed inside such a gargantuan structure. but as we toured the labyrinth's interior, took in the vistas from more than one luxury suite, and walked the field itself, we realized, with a sense of awe and wonderment, just how majestic Mercedes-Benz Stadium truly is! 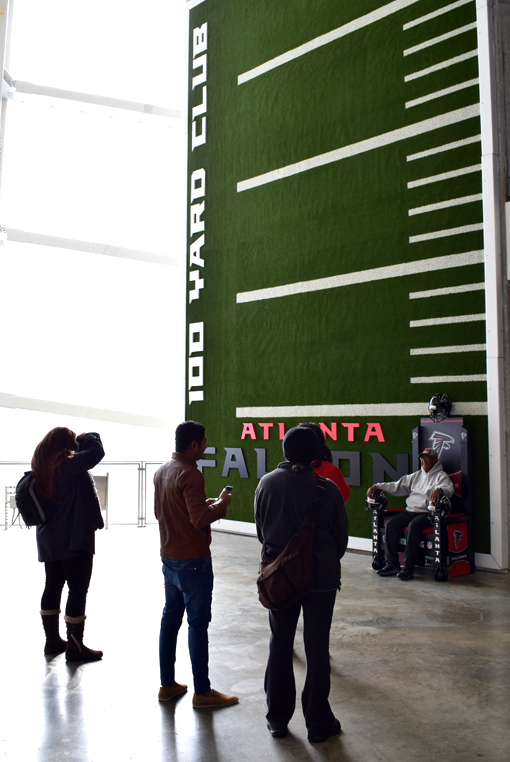 There are photo-ops everywhere, and our group made quite a few snapshots on our tour, but other than being on the field itself, sitting in the Falcons Throne at the 100 Yard Club was the photo to make! Prepare for sensory overload...on your hour-long tour, perhaps longer depending on your group, you're going to see and hear an exceptional amount of information about this stadium and the fan-based experience. Relax into it and enjoy, is my recommendation. Mercedes-Benz Stadium is home of the Atlanta Falcons AND the immediately, insanely popular Atlanta United FC. 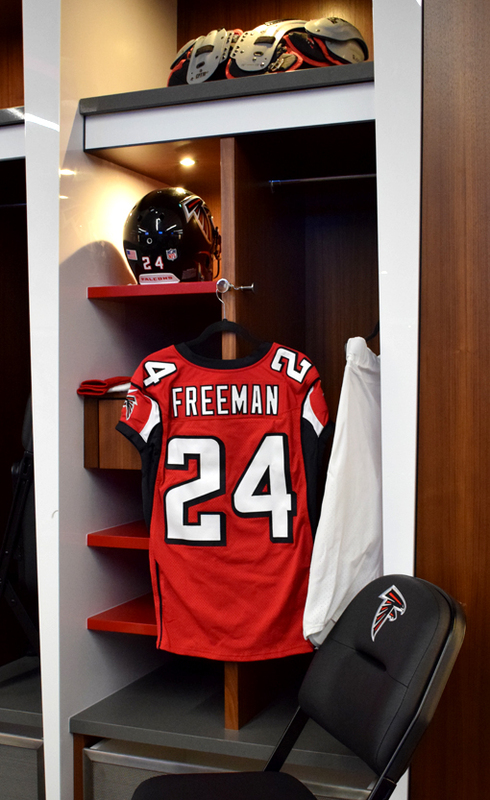 On our tour, we got to visit both team's locker rooms.Most of them tidy and packed away, our tour guides had displayed in a few the player's jerseys, shoulder pads, and helmets, adding to our excitement of walking in the steps of local legend sports celebrities. I've been on stadium tours before, but seeing Mercedes-Benz Stadium built from the ground up, casting a shadow on everything around it, I was certain the tour would be fun, but I had no idea of the grandeur that awaited us. 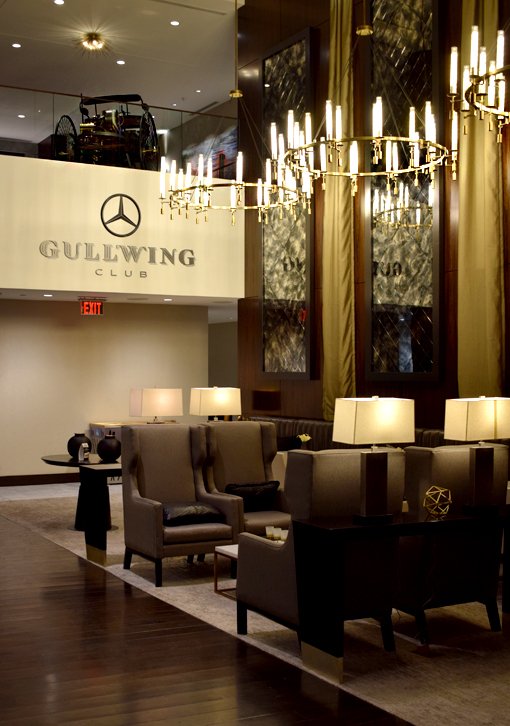 One of the highlights—and every stop seemed an even greater highlight—was a visit to Arthur M. Blank's personal suite. He and his wife decorated it themselves. We were only permitted in the first level, but you see that car up on the second level? That's the first model of Mercedes-Benz ever built! I remember when Georgia Dome was built. It was an exciting time. 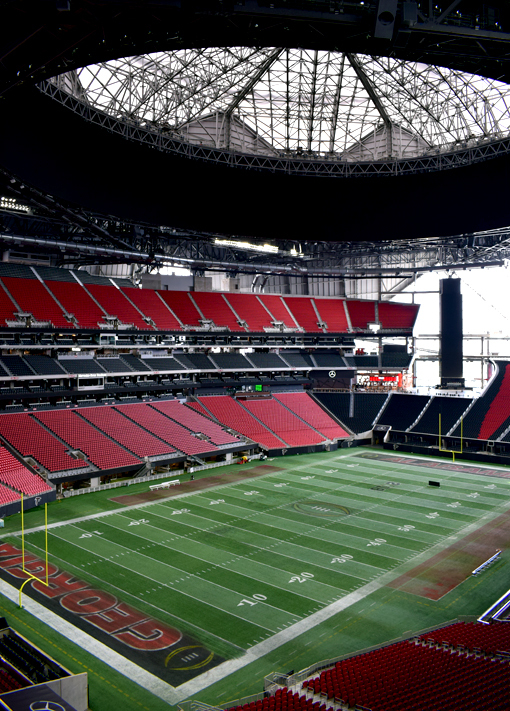 Not only was it huge, it featured the only roof of its kind at the time, as does Mercedes-Benz Stadium today with its retractable roof and "halo" digital display. 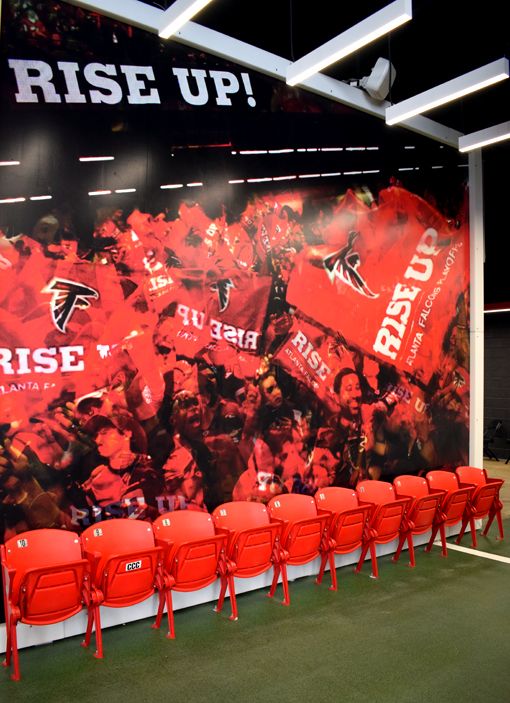 Mercedes-Benz Stadium pays homage to its predecessor in a number of places, but I particularly loved this section of seats from Georgia Dome and the wall treatment behind it..."RISE UP!" is a call of pride chanted from both stadiums. 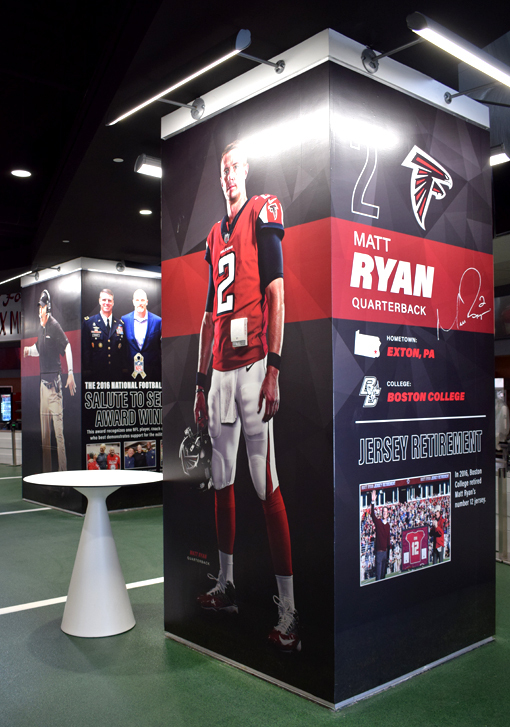 If you're new to Atlanta, here's a look at when I went on Georgia Dome's behind-the-scenes tour in 2010. I was the only person on that day's tour, whereas Mercedes-Benz Stadium tours can host as many as 50 guests! Georgia Dome was imploded in November 2017, and all that remains of the Atlanta Falcon's pre-Dome home, Atlanta-Fulton County Stadium, is a wall in a parking lot near the former Turner Field. 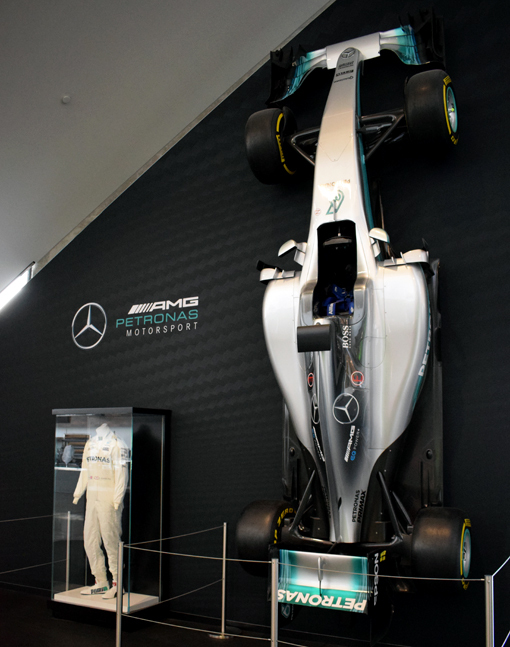 There is a large variety of Mercedes-Benz automobiles on display throughout the stadium, reportedly for sale the very day of your visit! A friend of mine, of more than 20 years, jokingly said that I should take his brand new Mercedes-Benz to get to the tour, that maybe I could park for free. Well, it turns out that there's something to that. I don't know the details, but if you own a Mercedes-Benz and drive it to game day, supposedly you get to park for free. Ask before you go, though. Upon learning this, a sense of nostalgia ran over me while recalling how much I loved my smoked silver Mercedes-Benz C230. Although I affectionately called it my "baby Benz", it was the safest I'd ever felt driving a car. A massive display, bearing "LOCAL LEGENDS" in large varsity letters, features a helmet from every team in the Georgia High School Association (GHSA). At the base of the display are photographs and other artifacts chronicling the history of this organization. 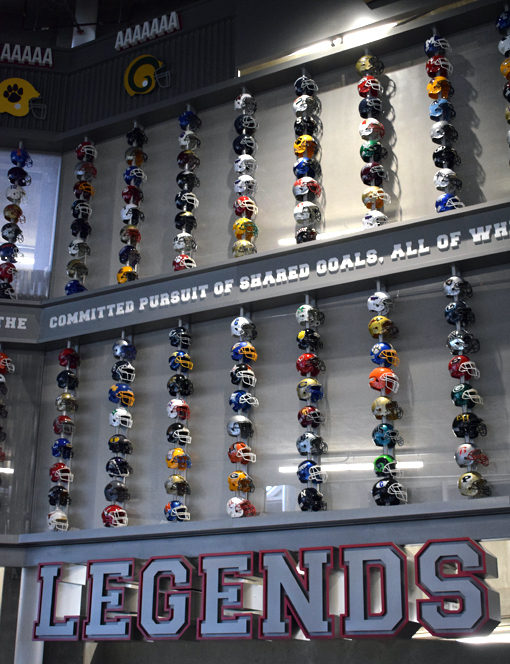 Immediately adjacent to the wall of helmets is a work of art created with colorful shoestrings donated by high school football players that spell out "ONE VOICE". 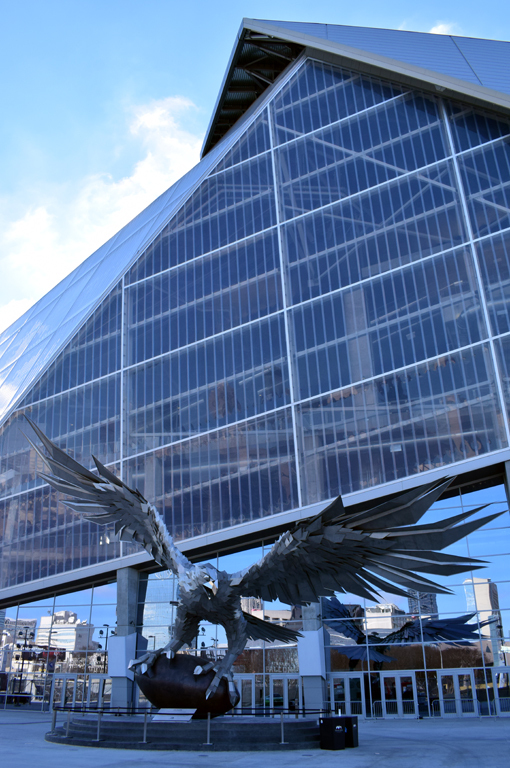 Throughout the stadium you'll see more than 180 fascinating works of art by renowned international and local artists, including a 70-foot tall stainless steel falcon grasping a bronze football—a memorable welcome to Mercedes-Benz Stadium! Following our tour, we enjoyed lunch at Molly B's, named for Arthur Blank's mother, which is open to the general public for lunch on non-game days. Lauralyn had the turkey wrap, Leo had the fried chicken, both reportedly excellent, and I had an amazing burger—absolutely delicious. What an amazing experience to dine while overlooking the field that is now a monumental symbol of pride for Atlantans and the site of regaled excitement for so many others. 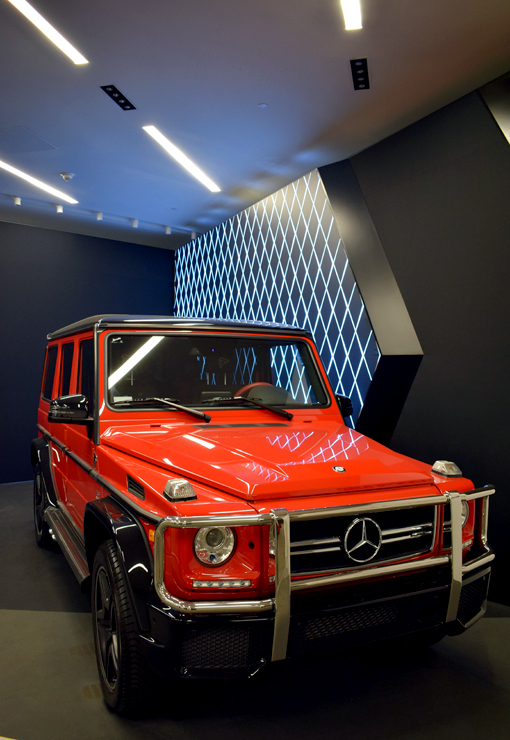 Whether a football or soccer fan, a lover of music, an architecture enthusiast, or a wanderlusting tourist like me, I highly recommend the Mercedes-Benz Stadium Tour! I've just been to a couple of games. I loved that it didn't really feel like I was inside. There are sight-lines to the field from everywhere and there are sight-lines for people watching everywhere. There's the giant window facing downtown so you feel in the city and part of the city. They had to roof open for one the games. I had no expectations for the roof, yet when open ti made the place even better. Maybe that's the best thing for me, I didn't feel indoors, cramped claustrophobic, I could always see or easily find the field. I'm looking forward to my next visit, a United game I hope.